Goodwood certainly is one of the best known location for classic cars event over the last 25 years with the international acclaimed Revival and the Festival of Speed. Few people know that the original race track in Chichester did not only host the RAC Tourist Trophy in the 1960s that is celebrated ever year during the Revival with the race for the GT cars of the era, but also hosted no less than 71 weekend race meeting for the members of the Goodwood Road Racing Club. 5 years ago the idea was born to give Goodwood another major event and the Goodwood Members Meeting was reinstalled in March as the spring meeting to counter the autumn Revival. Giving the members of the GRRC more access and to avoid a clash with the premium event the MM was designed as a low key event without the restrictions needed to meet the requirements of the sponsors. Basically the entire track could be seen including the famous chicane going on the main straight that is reserved to a minority during the Revival. Now in its 6th edition the MM established itself as the season opener for the British Classic Car Race season although this edition was given a later date in early April to avoid the cold weather of the previous years including snow in 2018. Although this year the March was much warmer than in previous years it was still a safer choice only with a few downsides. One of them was the lack of the typical yellow flower beds alongside the track that made the pictures of the previous years so recognizable (a warm February led to an early bloom), the other was the clash with the race series of Peter Auto that started its season the same weekend in Barcelona keeping a few entrants away from Goodwood who were committed to the entire French race series. Nevertheless the quality of cars was again well worth a visit and this year again not only attracted the cars but a lot of well-known race drivers. Some of them were reunited with their former racers just like Tom Kristensen demonstrating the Bentley EXP Speed 8 in the Bentley Centenary Year, others joined the numerous races or the other demonstration runs. Those demonstrations are also the highlights of the weekend as they make the single events distinguishable. This year celebrated the 50th anniversary of the legendary Porsche 917K, the BMW M1 ProCar, the history of Le recent LMP Le Mans cars and the visitors from the American NASCAR Series. Back in 1969 Porsche finally took the chance in the change of the regulations to come up with a contender for the overall title in the world sports car championship. The all-new 917 was shown to the public and the picture of the 917s lined-up in Zuffenhausen for the homologation might be one of the most famous in the Porsche history. The car was first shown in long tail configuration but as the car proved to be unstable at high speed soon the short tail (�Kurzheck�) was introduced that should win Le Mans both in 1970 and 1971. After the first overall victory by Hermann and Attwood the very first car was rebodied and painted in the winning Porsche Salzburg colours as demonstrator for the press department. 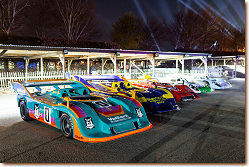 Now after 48 years the car is back in the original configuration and after making its post restoration debut in Stuttgart it was driven for the very first time in public last weekend, both by Attwood and recent LMP1 Porsche driver Mark Webber. It was joined by another 917K in Gulf colours as well as a 917/10 and two of the infamous 917/30 as raced in the CanAm series. Chassis 917/30-001 also made its first appearance in the former colours of Vaillant-sponsorship. Exactly 10 years younger were the other jubilees demonstrated in Goodwood with 5 BMW M1 Procars on track on both days. In times where the car seems to make more difference than the drivers talent specs-series were always a great measurement to compare the drivers. One of the most popular of these series were the M1 Procar races at the European F1 race weekend in 1979 and 1980. The series were won by Lauda and Piquet, especially for Lauda it must have been a welcome distraction from the horrible 1979 season where he only finished two races in the Brabham-Alfa Romeo. Many of the races are comparable with the Revival races although sometimes named different they feature the same cars. The exceptions are the real old cars as seen in the S.F.Edge Trophy featuring the big aero engined monsters built in between the wars or even before WWI. As the drivers are sitting more on the car rather than in the car the spectators can actually see them working when they try to aim them through the chicane. This race included highlight like the huge Fiat S76 that is a regular entrant at the Festival of Speed. Built to compete in land speed records this fire spitting �Beast of Turin� is a handful in corners. It post restoration debut made the Blitzen-Benz 200 HP from the Technikmuseum Sinsheim in Germany and raced by Ben Collings to a remarkable third place. Up in front was a duel between the very original Sunbeam Indianapolis of Julian Majzub and the Vauxhall Viper Special of Tony Lees. In a photo finish the Sunbeam was only 18/1000 seconds ahead in the closest finish of the day. Majzub was spotted losing a tire during practice but his mechanics were able to get the car back on track in only 3.5 minutes, well worth of a tires manufacturer as Majzub is the owner of Blockley tires. Unfortunately there is always shadow where on sees a lot of sun. Although the drivers were told well in advance that they should not go over the top risking theirs and the lives of the spectators again a few were driven by their own ambitions. In the very last race of the weekend a clash of a Cooper-Bristol and a Jaguar D-Type had a close encounter ending in the wall resulting in the only red flag of the weekend, literally in the very last minutes of Sunday racing action. Apart from the racing Goodwood is always good for a party and whereas the Revival is legendary for its spectators dressed up in period the Members Meeting hosts its own party on Saturday evening with life music, entertaining in the fun parc and the show of the drummers and the stilt-walkers. After sunset the backside of the grand hall becomes the amusement parc for a few hours enjoying the life at Goodwood. After 6 editions it is safe to say that the members meeting is not only a must-visit for the members themselves but also worth to look for the limited tickets available for non-members. Good racing with great access and evening entertainment, what can one ask more on a mild spring weekend. We will certainly be back next year when the 78th edition will be held, until then we look forward to the main events with the Festival of Speed less than 3 months away.